It was never going to be that simple, was it? Not given where we were. But still, we thought we knew better; that we could count on what would happen for the first two places at least. But no. 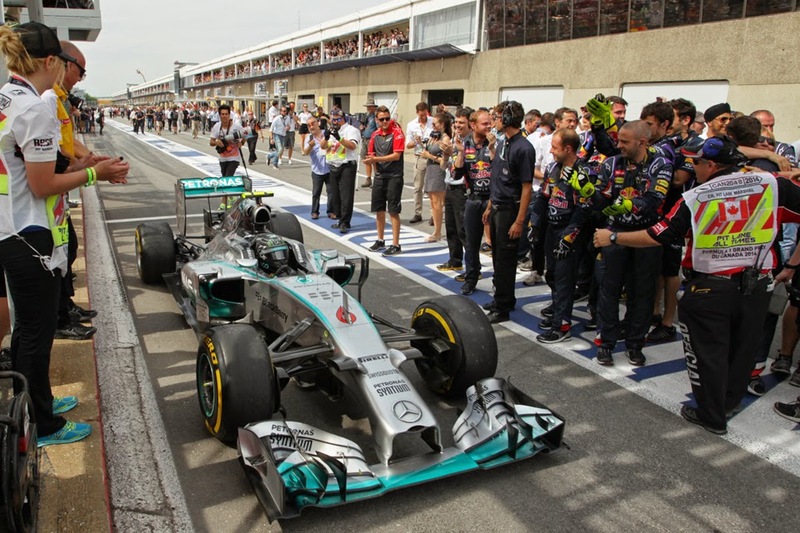 It turned out that not even the astonishing Mercedes preponderance of the 2014 F1 season could survive the Montreal mixer. Very few things do. For a long time it didn't look that way however, given that as usual in the first half of the race the Mercs disappeared. After the first 27 laps of green flag racing (the first seven were behind the safety car) the guy in third was 27 seconds shy of the nearest silver car way up the road. It looked again the Nico Rosberg vs. Lewis Hamilton private battle for the win that we've grown accustomed to. Lewis this time giving all indications that he had both the means and every intention of depriving Nico of his lead. At one point Nico was a little lucky to escape penalty after gaining half a second (and setting the fastest lap at that point) after skipping the final chicane, missing his braking point. Nico at another point came oh so close to spearing the wall at turn 4. Yet he survived both. But on lap 37 of 70 the Circuit Gilles Villeneuve's sense of the bizarre out of nowhere struck. Lewis reported a loss of power. Then of the very next lap Nico did too. It was a MGU-K failure for both, which deprived them apparently of 160 bhp each. Before we knew it we had the previously unthinkable sight of the two imperious Mercs circulating three seconds or more a lap over the pace of those behind. Suddenly things had got interesting. Such was the Mercs' thick cushion that it still took an extended period for anyone to get near, but sure enough the rest edged up (in among it all something other than a Mercedes led a race for the first time this season, as Felipe Massa had a few laps at the front between the Mercs' second stop and making his own). But by the time that they did get there Lewis was gone from the picture, him succumbing to brake failure just after clearing Nico at their second stops, a problem unrelated to the power unit maladies according to Paddy Lowe and more related to running in Nico's wake according to Lewis. The chasing pack was led by the unlikely candidate of Sergio Perez, who'd benefitted from a one stop strategy and a mammoth run of 34 laps on the supersofts. The trouble was that he didn't look able to challenge Nico upon reaching him - who had by now reclaimed some of his lost pace - but Checo also had sufficient straightline speed to keep two closely chasing Red Bulls - with Daniel Ricciardo having jumped stable mate Sebastian Vettel on strategy - away from Rosberg too. Massa also later cruised up onto the back of them, having lost vital time stuck behind his brake and overheating hobbled team mate Valtteri Bottas, but became another to not be able to make passing attempts stick. The race reached something of an impasse, and we had to contend with the possibility that such is the W05's advantage that it can still win races even when seriously hobbled. The top five, indeed the top nine just about, circulated within a single camera shot. For those with long memories or else a sense of history the race was redolent of the epic 1981 Spanish Grand Prix at Jarama. But Daniel Ricciardo wasn't having any of that. With four tours to go he finally cleared Perez with a throw-caution-to-the-wind pass into turn one, involving shaving the grass. Then he tore chunks out of Rosberg's advantage, and on the penultimate lap he cruised past on the long straight, Nico's fine drive against the odds at the last not being rewarded with victory. 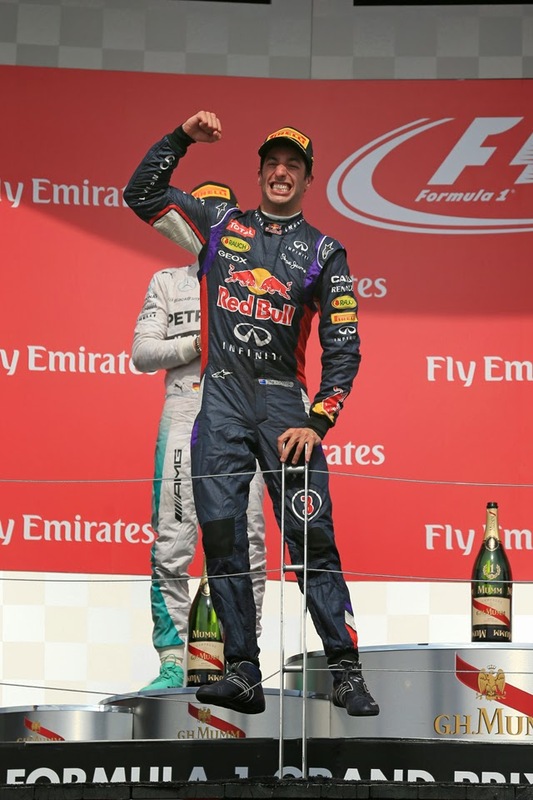 But no one could deny that Ricciardo's astonishing star is born season thus far deserved to be rewarded with a win. And today his drive was one of restraint and persistence and, when he needed it, devastating decisiveness. You'll struggle to find either anyone not pleased by the popular man's triumph, and afterwards his smile seemed to light the place up even more than usual. 'It's just an amazing feeling right now, really grateful for this' said the Australian. 'It's slowly sinking in' he added later, 'it took a while definitely. As soon as I got him (Perez) because we struggled so long behind him, I knew that if he could get him we'd have the pace in the first and second sectors to close in on Nico and get the DRS...From then on it was blinkers on...I knew from then (passing Rosberg) on it was just drive the next couple of laps clean and this one's yours. As well as drama, Montreal likes to provide debut Grand Prix triumphs, and Ricciardo joins the haughty list of the likes of Lewis Hamilton, Gilles Villeneuve, Jean Alesi and Robert Kubica. One assumes that unlike the latter two this won't be his last. All of a sudden too Mercedes's aim at a clean sweep of wins this season is officially over. But Nico will be well content with his efforts. If the race had something of Gilles' astonishing win in Spain in 1981, then Nico's race had something of another legendary Spanish race of the past about it, that of Michael Schumacher 13 years later, wherein he too somehow claimed second place despite what should have been debilitating mechanical troubles. And Nico was aptly rewarded; 18 points over Lewis and a 22 point lead in the drivers' table. And this in a season too wherein, short of mechanical failures and other DNFs of his own, there isn't likely to be more than seven between them in any single round. How things have changed in the last fortnight. 'It was a big battle all the way' said Nico afterwards. 'I didn't really know what was going on because I lost a lot of power so was very slow down the straights and I was just trying to hang on, trying to put qualifying laps all the time but it didn't quite work out against Daniel'. But there were a lot of heroes on show in the Canadian Grand Prix today. Sebastian Vettel completed the podium after a strong drive in Ricciardo's vicinity and he might even have completed a Red Bull one-two without a last lap safety car. That safety car sadly ended two other fine drives a lap ahead of time, as Massa and Perez made contact as the former sought to deprive the latter of fourth place at turn one, in a smash that resulted in a rather frightening impact for both (they only just avoided collecting Vettel too). Thankfully, at the time of writing, both reportedly are fine. The chief beneficiary was Jenson Button, who somehow rose to fourth in final shakeout having passed Nico Hulkenberg and Fernando Alonso just before the safety car appeared. Alonso was another who somehow clung to the leading pack, but was unable to clear his Merc powered adversaries on the straights. Sixth place behind Hulkenberg was his final reward. Some have complained about the entertainment value on offer in 2014 style F1. Perhaps in some rounds they've had a point. But today's race in addition to that in Bahrain means that we've now had two classics in among it. But while Bahrain's drama came somewhat out of the blue, today's really shouldn't have been a surprise. As mentioned, we were at Montreal. At Montreal things happen. At Montreal it is genuinely difficult to imagine ever witnessing a tepid race. 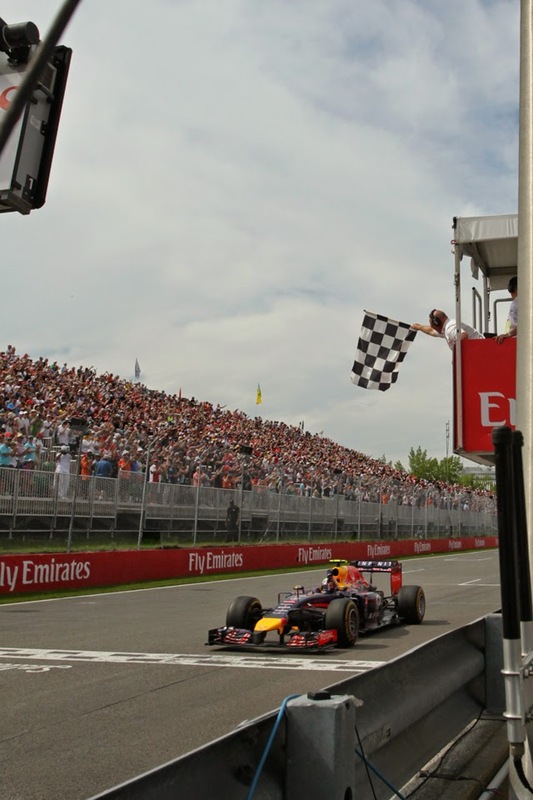 Long live F1 at Montreal. "At one point Nico was a little lucky to escape penalty after gaining half a second (and setting the fastest lap at that point) after skipping the final chicane, missing his braking point." I still can't believe no action was taken. Hamilton was about to overtake him, he gained a clear advantage and Hamilton's engineer told him to hold station until word came from RC. Even with that, he still caught Rosberg again and again. This race has left me with a bad feeling. I don't want to believe it, but I am beginning to wonder if racism could be a factor in this. I didn't think it was a nailed-on penalty but equally I don't think Rosberg could have complained too much if he had been penalised. It wasn't so much not giving Lewis the place, more that he gained about half second from doing it. I think if he'd only got out of throttle on the following straight and let the gap come down to what it was no one would have had many grounds to complain. As for the possibility of racism, it's something we need to be on firm ground about before suggesting. It's a very serious suggestion after all. In my view we would need much more compelling evidence than we have right now before going there.